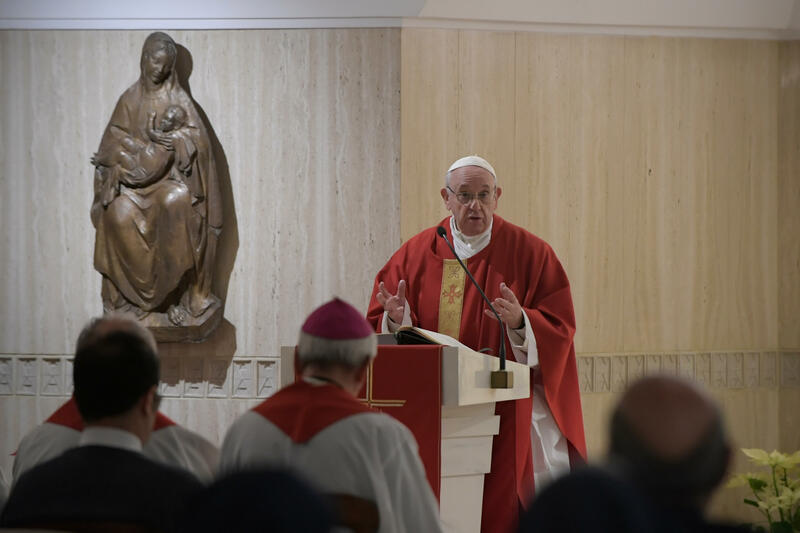 The Holy Father’s comments came January 21, 2019, in his homily at morning Mass at Casa Santa Marta in the Vatican. His remarks were reported by Vatican News. The Pope explained that the Gospel is a gift to us, but like new wine, something must change about the container in which the gift is received. For us, the container is our behavior. And before the Gospel, the Pope said human behavior was “accusatory, worldly, and selfish.” That is not behavior that fits with the new wine of the Gospel. The Holy Father warned of the “un-Christian” style: “the selfish spirit, the spirit of indifference that is common in our communities. One believes oneself to be a good Catholic but doesn’t worry about the problems of others – wars, illnesses and the suffering of our neighbors.” This, the Pope said, is the hypocrisy that Jesus reproached the doctors of the law for. What then is the Christian style? Francis said the style is described in the Beatitudes. The Beatitudes offer the prescription for the Christian’s new behavior: meekness, humility, patience in suffering, love for justice, ability to endure persecution, not judging others. “If a Catholic wants to learn the Christian style, so as not to fall into this accusatory style, the worldly style, and the selfish style, he must read the Beatitudes,” Francis said. “They are the wineskins, the path we must take. To be a good Christian one must have the ability not only to recite the Creed with the heart but also the Our Father with the heart.